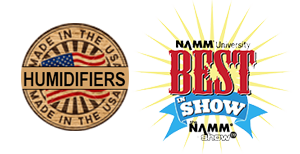 We met Fred Kamaka Jr. of Kamaka Ukulele at the 2007 NAMM show in Anaheim. The air at the show was very dry and he was concerned about his ukuleles developing cracks. At the time, we only had the OH-1 guitar humidifier to offer him, so that is what he used at the show to protect his ukuleles. Fred made it very clear that we needed to come up with a humidifier specifically designed for the ukulele. In response, we developed the OH-18 ukulele humidifier. It is the same size as the OH-1 humidifier, but has a special hanger which allows the humidifier to hang at an angle from the strings inside the ukulele soundhole. 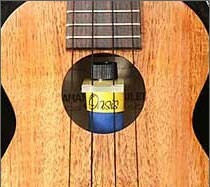 Because the ukulele is a smaller instrument, it needs less supplemental humidification than a guitar. The humidity reduction was accomplished by modifying the liner for the OH-18 ukulele humidifier. 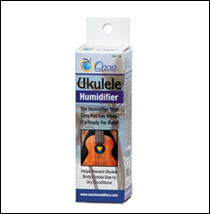 The OH-18 ukulele humidifier comes with the special ukulele stabilizer and a 10 cc syringe for increased distilled water filling control. 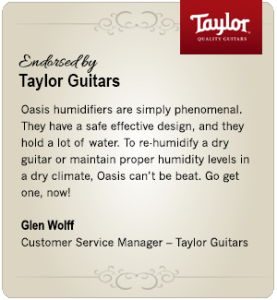 Purchase an Oasis® Ukulele Humidifier today.